1998: The City of Jersey City has purchased the Apple Tree House. The city plans to designate the house as a local landmark. 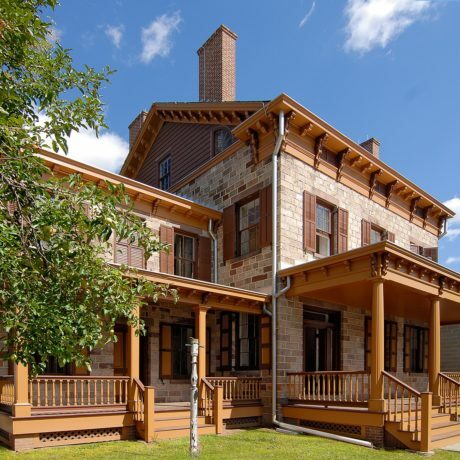 2004: The City of Jersey City has received an NJ Historic Trust (NJHT) grant to prepare a preservation plan for the house. 2006: The city has received a second NJHT grant for interior restoration and accessibility improvements. 2007: The house is currently in Phase II of a three-phase restoration. The first phase completed the restoration of the entire exterior. The second phase involves interior restoration. The third phase will involve the land around the house. Upon completion of the entire project, the first floor of the house will include a house museum and visitors center. Jersey City’s Division of Cultural Affairs, which is overseeing the restoration, will be housed on the second floor. They intend to work together with the Jersey City Landmarks Conservancy and other preservation and non-profit groups to begin tours, host events and allow community groups to use the space. The city aims to ensure that the house will be accessible to the public, possibly open up to seven days a week. The Division of Cultural Affairs intends to entice and maintain steady visitors by using the visitor center as a place where people can purchase and pick up tickets to local arts and cultural events. 7/2010: Restoration of the property is in progress. 2016: Restoration of the property is complete. The Apple Tree House is one of New Jersey’s oldest and most historically significant buildings, with portions dating to the 18th century. Officially it is the Van Wagenen Homestead. The land was the center of the first Dutch settlement of Bergen in what is now Hudson County. This house was also the site of an important incident during the Revolutionary War – when General George Washington and General Lafayette held a meeting in 1779 in the shade of the apple tree which at that time grew in the front yard of the house – and it is from that incident that the house got the name of Apple Tree House. The house is currently threatened by demolition.